Integrity Monitoring rules describe how Deep Security Agents should scan for and detect changes to a computer's files, directories, and registry keys and values, as well as changes in installed software, processes, listening ports, and running services. Integrity Monitoring rules can be assigned directly to computers or can be made part of a policy. This article specifically covers how to create an Integrity Monitoring rule. For information on how to configure the Integrity Monitoring module, see Set up integrity monitoring. There are two types of Integrity Monitoring rules: those that you have created, and those that are issued by Trend Micro. For more information on how to configure rules issued by Trend Micro, see the Configure Trend Micro Integrity Monitoring rules section. Enter Integrity Monitoring rule information . Select a rule template and define rule attributes. Create a new rule. Click New > New Integrity Monitoring Rule. Import a rule from an XML file. Click New > Import From File. Copy and then modify an existing rule. Right-click the rule in the Integrity Monitoring Rules list and then click Duplicate. To edit the new rule, select it and then click Properties. Enter a Name and Description for the rule. It is good practice to document all Integrity Monitoring rule changes in the Description field of the firewall rule. Make a note of when and why rules were created or deleted for easier maintenance. Set the Severity of the rule. 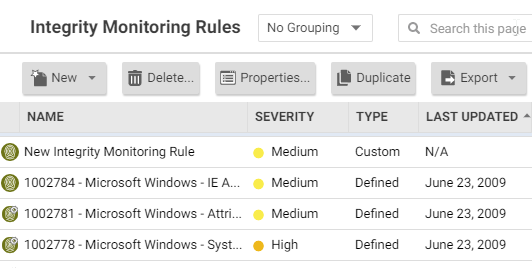 Create an Integrity Monitoring rule to specifically monitor changes to registry values. The Registry Value template is only for Windows-based computers . Select the Base Key to monitor and whether or not to monitor contents of sub keys. List Value Names to be included or excluded. You can use "?" and "*" as wildcard characters. Enter Attributes to monitor. Entering "STANDARD" will monitor changes in registry size, content and type. For more information on Registry Value template attributes see the RegistryValueSet documentation. Create an Integrity Monitoring rule to specifically monitor changes to files. Enter a Base Directory for the rule (for example, C:\Program Files\MySQL .) Select Include Sub Directories to include the contents of all subdirectories relative to the base directory. Use the File Names fields to include or exclude specific files. You can use wildcards (" ? " for a single character and " * " for zero or more characters. Leaving the File Names fields blank will cause the rule to monitor all files in the base directory. This can use significant system resources if the base directory contains numerous or large files. Enter Attributes to monitor. Entering "STANDARD" will monitor changes in file creation date, last modified date, permissions, owner, group, size, content, flags (Windows), and SymLinkPath (Linux). For more information on File template attributes see the FileSet documentation. Create a custom Integrity Monitoring rule template to monitor directories, registry values, registry keys, services, processes, installed software, ports, groups, users, files, and the WQL using the Deep Security XML-based Integrity monitoring rules language. You can create your rule in your preferred text editor and paste it to the Content field when you are done. Integrity Monitoring rules issued by Trend Micro cannot be edited in the same way as the custom rules you create. Some Trend Micro rules cannot be modified at all, while other rules may offer limited configuration options. Both of these rule types will show as "Defined" under the "Type" column, but rules that can be configured will display a gear in the Integrity Monitoring icon ( ). You can access the configuration options for a rule by opening the properties for the rule and clicking on the Configuration tab. When the rule was first issued and last updated, as well as a unique identifier for the rule. The minimum versions of the Agent and the Deep Security Manager that are required for the rule to function. Although you cannot edit rules issued by Trend Micro directly, you can duplicate them and then edit the copy. Any changes detected by an Integrity Monitoring rule is logged as an event in the Deep Security Manager. By default, events are logged at the time they occur. If you only want events to be logged when you manually perform a scan for changes, deselect Allow Real Time Monitoring. You can also configure the rules to trigger an alert when they log an event. To do so, open the properties for a rule, click on Options, and then select Alert when this rule logs an event. You can see which policies and computers are assigned to an Integrity Monitoring rule on the Assigned To tab. Click on a policy or computer in the list to see their properties. You can export all Integrity Monitoring rules to a .csv or .xml file by clicking Export and selecting the corresponding export action from the list. You can also export specific rules by first selecting them, clicking Export and then selecting the corresponding export action from the list. To delete a rule, right-click the rule in the Integrity Monitoring Rules list, click Delete and then click OK. Integrity Monitoring rules that are assigned to one or more computers or that are part of a policy cannot be deleted.